Radio Shaker aims to surprise its audience by offering the largest variety of online radio stations from all over the world. From the smallest indie rock station to the hottest dance stream. We've got it. We've collected the best stations so you can enjoy great music of all sorts. Believing that online music out there is endless, we want to help you as a listeners to navigate and explore even more of it. Radio Shaker was founded in 2011 helping listeners and broadcasters to connect and share their passion for music. Our first version of Radio Shaker was created in 2011. A lot of the technology, user interface has changed in the past years and Radio Shaker had to change along with it. After a year of redesigning, redeveloping and reprogramming the new Radio Shaker was created. And now you are able to listen from anywhere, anytime, on any device. it's so much fun to Shake it! Join us for FREE as a listener or as a broadcaster. 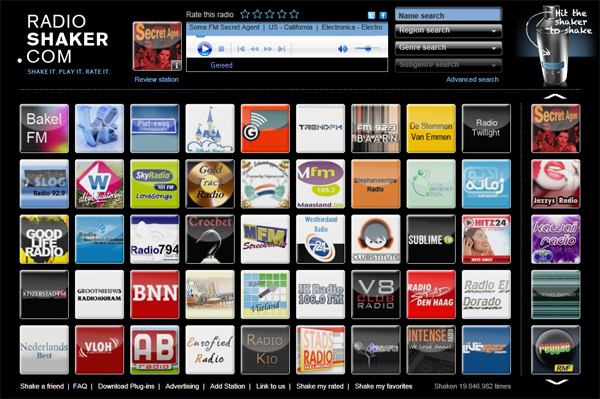 Radio Shaker is a free, fun and different way to listen to online radio stations from all over the world. Now available on all devices with our improved player and website. Listen to Radio Shaker for FREE, anywhere, any time, with any device. A free, fun and different way to listen to online radio stations from all over the world. Connect with old and new listeners from all over the world. You control and maintain your stations information, logo, streams and many more features. Listeners can add you as their favorite, connect, share, like and review.